Choose Tyn Dwr Hall for your special day and you’ll enjoy exclusive use of a magnificent Grade II* wedding venue in North Wales, nestled among ancient woodland and rich greenery. The grounds and gardens are nothing short of magical. Located near the picturesque town of Llangollen, Tyn Dwr Hall is one of the more unique wedding venues in North Wales and promises a tranquil and awe-inspiring country escape for your wedding. All year round, this is a beautiful destination wedding venue, ideal for local couples and city brides and grooms alike, with ample accommodation for your loved ones to stay. 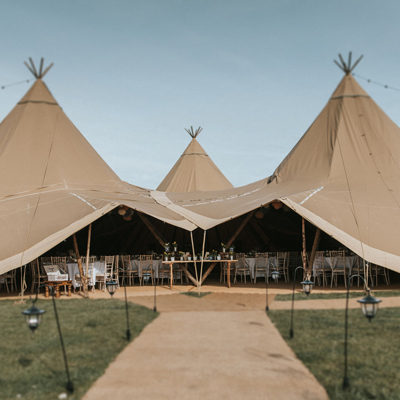 It boasts three Bridal Suites and a selection of exquisite guest rooms including a glamping village and Yew tree cottage, providing accommodation for up to 66 guests – making it the ultimate destination wedding venue. 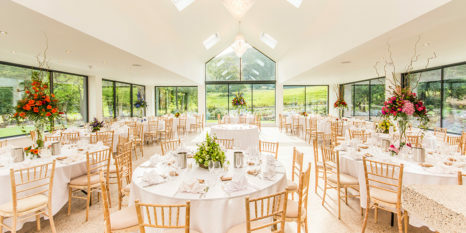 If you’re planning a big wedding, ceremonies take place in the Ballroom, an impressive space for up to 120 guests and which is conveniently located right next to the breathtaking Garden Room. The newly-built room is a bright and romantic reception space with floor-to-ceiling windows that look out on Tyn Dwr’s awe-inspiring grounds. There’s room for 160 guests in the Garden Room which will be complete with elegant round tables for your wedding breakfast. Just off this wonderful reception room is the Dickens Bar, a slick and sophisticated new addition to the venue. 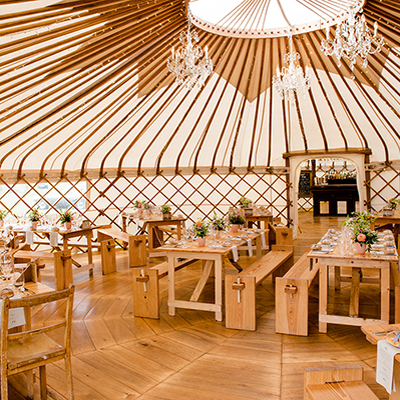 If an outdoor wedding is high on your list of priorities, Tyn Dwr promises a memorable backdrop. Toast your marriage on the new elevated Terrace, which is connected to the Garden Room should the weather turn and invite your guests to descend its steps to explore the beautiful gardens. A Woodland Walk has also been added to the grounds and will guide you past some of the oldest trees in Wales and towards the enchanting two-tier waterfall – a unique spot for photographs. Come evening, this is a great place to relax with your guests and to look back on the memories that have been made that day. Please call the wedding team on 01978 884 664 for more information and to book an exclusive viewing of the Hall.